Written by Nam Nguyen. Photos courtesy of Manzi Art Space. The project, a long-term public art exhibition initiated and curated by Manzi Art Space, aims to build awareness and appreciation for art among the public and help artists develop independent practices within the context of modern Vietnam. The first Into Thin Air exhibition took place in April 2016 and featured physical artworks displayed around the capital. Many faced removal. The second installment, however, is a permanent display of 10 virtual artworks, including installations, performances, and videos, all of which are accessible via a map on a smartphone app. Into Thin Air 2, which launched in October last year, literally pushes public art to a higher level. Before the opening, a series of 10 works were uploaded onto the internet and, through the use of augmented reality and apps, visitors can view and interact with the exhibits in a series of locations across the capital. Each space was chosen by participating artists, and based on personal experiences, childhood memories, history, and modern society. The exhibition takes creativity outside of its conventional comfort zones, such as museums and white-walled galleries, and brings them into public spaces. The traditional etiquette of ‘look, don’t touch’ no longer applies; for this form of interactive art, the instruction “please touch” more accurately suits the spectacle. For me, two works particularly stood out. 'The Wanderer' by Vu Ngoc Khai. This piece, created by Hanoian sound artist Nhung Nguyen (Sound Awakener) and Christian Grothe from Berlin, inhabits Ba Dinh Square. With Ho Chi Minh Mausoleum to one side, the space is a tourist attraction and site of deep cultural importance but also serves as a public park for local people. From 6am each morning, city dwellers visit to relish an unusually expansive space, and enjoy stretching, walking or tai chi before the din of rush-hour begins. Yet, due to the nature of the mausoleum, the square is less crowded than other public locations in the city. To reflect this, Nhung and Grothe composed a series of tranquil, ambient sounds using various acoustic instruments. They crafted euphonious melodies — suitable for a walk or jogging — featuring lots of resonant, sonorous sounds. Their works emphasize tone and atmosphere over traditional musical structures or rhythm. 'Calm Reality' contains 6 different compositions spread evenly across the square, with each marked by different colors on the map. Let’s start with the yellow square. The track begins with the sound of something falling down, or two objects touching each other, creating the impression of an explosion. The noises could derive from the engines of buses or bikes driving by, but with added reverb. Then comes the bass, which enters deeply into the mind of the listener. The repetition of these tones, mixing together as the pitch goes higher and higher, imbues a sense of movement. Starting with a crescendo, the song soon falls into diminuendo before fading out, describing the process of a blast. The second ‘blue’ composition was composed mainly on piano and uses just a short range of repeated notes. Reverb is employed, bringing an atmosphere of progression. While the first composition gave birth to something, the second describes how it develops by generating faster movements. Here, you still can hear the explosion, but also found sounds recorded in outdoor environments. In another recording on the opposite side of the square, flute and tubular instruments are used. By blowing into the instruments, often from left to right or from both sides and stopping in the middle, the artists mimic natural breathing patterns. The harmony moves from tonic to dominant and adopts the key of F throughout the entire duration. In classical music, F-Major compositions, such as 'Beethoven’s Symphony No.6,' convey a sense of nature and life. Here, the flutes echo birdsong, but with added percussive elements. While the first tracks were mechanistic in tone, in this arrangement the feeling is far more organic. In the middle of the square, the two sounds meet and merge. This is the last step of a whole process. Two creations were born: one from a machine, and one from nature. They grew and found their way to each other before finally colliding, melting into one and dissolving. ‘Calm Reality’ is not only a sound walk, it is also a connector between audience and place, and an abstract narrative of growth. In the heart of Hanoi, just north of Hoan Kiem Lake, Dong Kinh Nghia Thuc Square has witnessed vital moments in the city’s history. Maritta Nurmi, a Finish artist based in Hanoi, embraces this historical significance in her work ‘Fate of Place.’ A vast, cylindrical pillar rises from the square’s central fountain. A glowing light inside gives a lantern-like appearance, while the sculpture’s form suggests a construct that can stand the test of time. The top and bottom ends are open, revealing a bamboo structure inside, and as the work rotates notable images appear in sequence. Viewing 'Fate of Place' on an iPad on a balcony overlooking the fountain. At first, we see elephants, until it transforms into scenes of trams, the flowing fountain, children playing beside coconut trees, a crowd of people stand by old cars and motorbikes, and planes dropping bombs. Each tells a part of the area’s history, from the days when it was known as a “coconut garden“ by local people, to when it was named Place Negrier by the French, and up until the present day. Thanks to the plethora of photos she found while researching the square’s history, Nurmi manages to maintain fastidious attention to detail. She portrays every zenith and nadir, from youthful play around the fountain to shocking atrocities of war. Turtle Tower has a Statue of Liberty placed on top. Around the lake, fish and the now-deceased Cụ Rùa are seen swimming. After the war, much of the city is seen shelled into ruins, leaving little to find apart from peace. Then comes the revival, from one single line of people driving by, the pillar slowly fills up with bikes and cars. The work also gives a very local vibe; things spin around, crowded, but unhurried. Sometimes it’s completely empty before a sudden change takes place. Yet always imbued with Hanoians’ earnestness, tenacity, and will to survive. These are just two of 10 great artworks spread throughout the city. Others are accessible in spots such as Lenin Park, the Botanical Gardens, and Hom Fabric Market. Creations by both Vietnamese and foreign artists are on display, with all information about locations and artists involved accessible via the app. 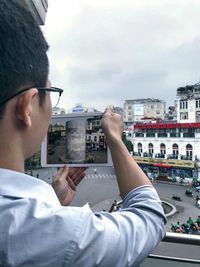 Through the medium of a digital exhibition, Into Thin Air 2 achieves a new level of innovation by providing a platform not only for artists to freely challenge themselves but also by pioneering a promising new way for Vietnam’s smartphone generation to interact with public art. Young people especially are being given the chance to access, relate to and build their awareness and appreciation of contemporary art. And while most exhibits are by their very nature impermanent, this virtual showcase could technically exist indefinitely.